Conceived By The Holy Spirit, Born Of The Virgin Mary...."
The Second Member of the Holy Trinity is Jesus. The name "Jesus" means "Savior." As His name indicates, that is Jesus' main role. As our Savior, He saved us from our sins and the eternal punishment that would be ours. He did this by dying on the cross to pay for our sins. Because of His perfect sacrifice on the cross, we don't have to pay for our sins..
All that we must do is simply respond in love and thanksgiving for this remarkable, undeserved gift. Each member of the Trinity--Father, Son and Holy Spirit--demonstrate grace to us each and every day. What is "grace"? "Grace" simply means "an undeserved, unexpected gift." * From God, the Father, we receive His undeserved grace whenever we receive food, shelter or enjoy the blessings of His watching over us in this world. * From God, the Son, we receive grace each time we are forgiven. There is nothing we could do to earn God's forgiveness. After all, we're sinners! But God, in His grace, gives us undeserved--and unexpected--forgiveness through the grace given through Jesus Christ. * From God, the Holy Spirit, we receive grace as He brings us to faith and keeps us in faith through His gifts of grace: Word and Sacrament. "I believe that Jesus Christ, true God, begotten from all eternity and true Man, born of the Virgin Mary, is my Lord....He has redeemed me...not with gold or silver, but with His holy, precious blood and by His innocent suffering and death." What is our response to all of God's gifts? We should "thank and to praise, serve and obey Him." "This," as Martin Luther emphasized, "is most certainly true." When Jesus was conceived of the Holy Spirit and born of the Virgin Mary, He became "incarnate." This means that Jesus took on human flesh and became just like us--except without sin. Why did Jesus have to be human? He needed to be human so He could be our substitute to bear our sins for us. When Adam and Eve sinned, God placed on them the full responsibility and punishment for their sin--including eternal punishment in hell. Because we sin we, too, bear that same punishment that Adam and Eve did. Because God is just and fair, He must demand that someone pay the punishment for our sins. Since sinful humans cannot pay for their sins, in His greatest action of grace, God sent Jesus to our human substitute for sin. As our sinless, holy substitute, God accepted Jesus' death on the cross as the payment for our sin. Because of this action, we are justified or considered "not guilty"...even though we were. Because we are justified, God considers us forgiven "Just-As-If-I'd" not sinned at all. In order to be our Savior, Jesus also had to be God. Why? Because only God can forgive sins. And the only payment that God could accept in our place for our sins was a payment from God Himself. As God, Jesus co-created the world with the Father and the Holy Spirit. As God, the Bible says that Jesus raised Himself from the dead. As God, Jesus reigns over the whole world--in grace--in the hope that all might believe and have faith in Him. In Philippians chapter two, St. Paul gives what may be the clearest Scriptural explanation of Jesus' two natures. "Your attitude should be the same as that of Christ Jesus: Who, being in very nature God, did not consider equality with God something to be grasped, but made Himself nothing, taking the very nature of a servant, being made in human likeness. 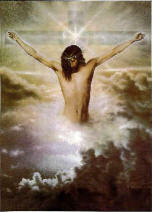 And being found in appearance as a man, He humbled himself and became obedient to death--even death on a cross! Yes, Jesus is truly God. Someday all people, whether they believed in Jesus as their Lord or not, will bow before Him and revere Him as the King of Kings and Lord of Lords. The Apostles' Creed, reflecting Paul's teaching of Jesus in Philippians 2:5-11, teaches the two stages of Jesus' ministry. The first stage of Jesus' ministry was His humiliation. From the time He was conceived by the Holy Spirit in Mary's womb, until the time he "suffered, died, and was buried," He humiliated Himself to be our Savior. Though fully God, He willingly set aside the full demonstration of His deity and divine power so that He could be human--just like you and me...except without sin. As a human being, Jesus hungered and ate. As a human being, He had parents. As a human Baby, He no doubt cried when His diapers needed changing or when He wanted His mother to holy Him. As a human being, He had learn from teachers the wisdom of this world. As a human, He cried when His best friend, Lazarus, died. As a human, He truly suffered extreme pain on the cross. As a human, Jesus also experienced death. Taking on human flesh and becoming true man is the focus of Jesus' humbling Himself and taking on human flesh to be our Savior. The Second Article teaches Jesus' humiliation. "And in Jesus Christ, His only Son, our Lord. Who was conceived by the Holy Spirit, born of the Virgin Mary, suffered under Pontius Pilate, was crucified, dead and buried." The Second Article of the Apostles' Creed continues describing the stages of Jesus' exaltation. "He descended into Hell. And on the third day He rose again from the dead and ascended into Heaven. From there He shall come again to judge both the living and the dead." As the resurrected Victor over sin, death and the Devil, Jesus' descent into Hell marked His triumph over Satan and all His angels. By going to Hell, He demonstrated to all unbelievers that God's promises--which they ridiculed and disbelieved--were true. By appearing in their very present, Jesus made the weight of their consciences even more unbearable as they recognized how they resisted--and rebelled--against God's plan of salvation for them. After appearing to Satan all those in Hell as the resurrected Christ, the Scriptures and the Creeds testify that Jesus rose and appeared to many people. He appeared numerous times to His disciples, to Mary and others who were close to Him, as well as other followers. Was Jesus really alive? Yes! John indicated. John and others saw Jesus, talked with Jesus, and with their very own hands touched His resurrected flesh. Forty days after Jesus' resurrection, He went back to Heaven to resume His full authority as God. No longer would He humble Himself for us. The full payment for our sins had been made on the cross. Now that His earthly work of salvation was completed, He went to Heaven to sit at God, the Father's right hand. From there He rules over us today...and through eternity as our Savior, God and Lord. All we wait for now, the Apostles' Creed notes, is for Jesus' return. "From there He will come to judge the living and the dead." Will you see Jesus' return? Indeed you will. When Jesus returns on the Last Day of the earth, the dead in Christ will be resurrected first. Those who are living will stand next to those who are resurrected and behold His coming...and worship Him. What will it be like to be in heaven with Jesus? It will simply be pure joy. It will be a place without death, pain or sin. Heaven will be where we see Jesus in all His glory...and worship Him endlessly as the one who loved, saved and redeemed us. Won't that be an amazing experience! Indeed, come Lord Jesus!